Gurbani is God's scripture, as set down in the Adi Granth by the Gurus. By reading and understanding the Gurbani, one can approach the understanding the Gurus had of the will and way of God. It is considered an aspiration for all Sikhs to learn Gurbani and gain an understanding of our Guru Ji. The classes endeavour to teach the pupils to rectire Gurbani with vigour, pyar, sharda and in its proper form. 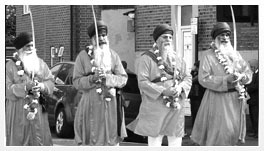 Gurbani classes have been run at the Gurdwara for a number of years. They are open to children and young adults of all ages. Kundalini & meditation offers a powerful and uplifting experience integrating the physical, mental, emotional, and spiritual aspects of your being. Yoga means a discipline of mind and body a union. It helps develop a strong mind and sense of peace to deal with the pace of modern life and to remain flexible in the face of stress and change. Classes are open to all ages.